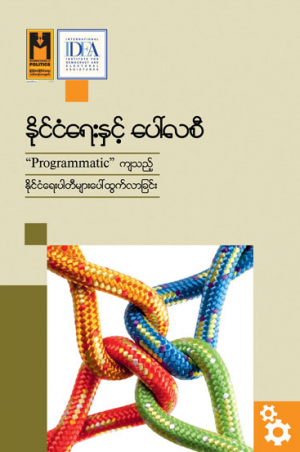 Politics Meets Policies: The Emergence of Programmatic Political Parties (Myanmar language translation 2016) is a Myanmar School of Politics and International IDEA co-publication and Myanmar translation of the latter’s 2014 book by the same title. It is based on the work carried out by three teams of political scientists who examined what drives and strengthens programmatic politics, even under unlikely conditions. The publication offers food for thought for political parties that are struggling to shift from personality-based or clientelistic-focused approaches—to more programme-based strategies as they reach out to voters.